Rose is originally from the UK, but now lives on the beautiful island of St Kitts & has worked as a Taxi & Tour guide for over 25 years. Jim is from St Kitts, however he lived in UK for over 22 years before returning to St Kitts, he has been a Taxi & Tour guide for over 22 years. Rose & Jim are passionate about St Kitts and the beauty it has to offer and they both have a wealth of knowledge in relation to the island. They have travelled extensively and have experienced cruising for themselves, this gives them first hand experience and a unique insight to the expectations of guests visiting the island. Rose & Jim have used their experience along with a knowledge of the island to ensure they provide the highest level of customer service, this along with their friendly and professional approach makes them a favourite amongst visitors to the island. 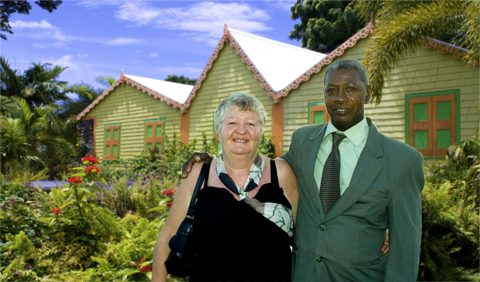 Many return guests to St Kitts have specifically requested Rose or Jim as their tour guides. Both Rose & Jim are members of the St Kitts Taxi Association which has been running for over thirty years now.